As the company grows with projects beyond The Witness, we thought it'd be nice to show progress on something not too secretive. For those folks into technical posts, I'll discuss how we used our new programming language to create an automated framework to test the language itself. Jon wanted to convert his demos into proper language tests, and add in new ones. Testing becomes increasingly important as we approach a closed-group release. As it turns out, the literature on compiler testing is scarce, and getting access to quality test suites is pricey (see C or FORTRAN). I've also disliked test frameworks in general, which added to the problem. In the interest of feeling joyful and productive, I decided to sit and think about the specific reasons why I've been unhappy with frameworks, and to use the language to write one I'd enjoy using. Can we make a procedure's return type randomly change at compile-time? What if a polymorphic procedure is used as a constructor? How do we prevent certain structs from using a procedure as a constructor? Can we generate bytecode for a slightly different procedure because of the struct that is using it as a constructor? Note: We tend to use the term procedure instead of function. Don't worry if the questions seem bizarre (the language is new and hasn't been released yet). The common theme is they all require very different language features to interact with each other (i.e. cross-cutting). For example, the first item could be handled polymorphically with the modify directive, enums, a switch statement, and some random bit generator. The answer to the second item is that nothing bad happens; in fact, this opens the door for multiple structs to use the same polymorphic procedure as their constructor. This observation naturally leads to questions three and four. When I wrote the tests for some of these, compiler bugs were uncovered naturally and without much effort. Ability to write tests as if they were real, independent programs. Simple asserts the tests can use. By default, virtually zero interaction with the test framework. 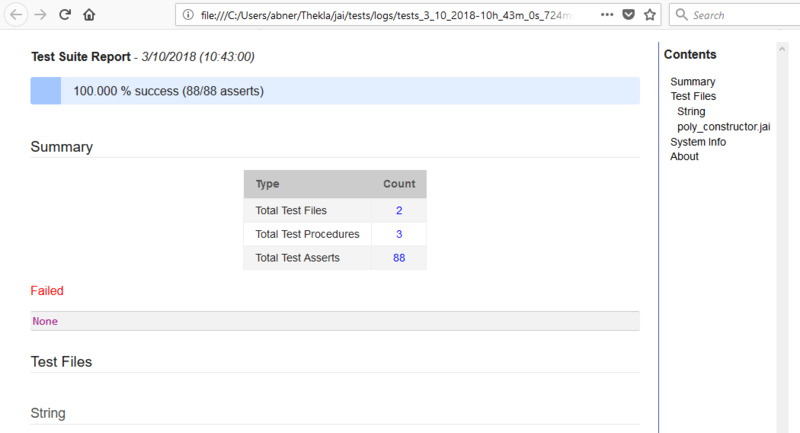 Minimal test suite reports that are nice to look at. By a minimal report I mean showing me which programs ran and when, how many test asserts were called and where to find them if they failed. The report should look good so I can help my brain enjoy the overall experience. To showcase the framework we ended up creating, let's go through an example, transforming a program into a language test. Here's the program that tackles one of the simpler inquiries from earlier: What if a polymorphic procedure is used as a constructor? While we're at it we'll ask the same of destructors. our_thing : Thing; // Constructor fires off.
} // Destructor fires off. As I had mentioned, this means multiple structs can use the procedure as their respective constructors. // Test with multiple structs. Notice I changed the name from main to something else and added the simple note TestProcedure. Notes are essentially comments recognized by the compiler that do nothing by default. Let's put that file in a tests/ folder. Ah, the reader will notice I have a file conveniently called tests.jai. Let's compile it. That produced tests.exe; let's run it! We'll use some real screenshots this time. And we just made a full test suite run. from a String file. More on that soon. our_thing : Thing = ---; // Uninitialized var. // We can do the same for AnotherThing. If the test writer heads to the test files section, the procedure that failed would be made apparent. So how do we explain that weird String file from the reports earlier? We didn't write that! Well, Ignacio found it useful to use this framework for the language's system modules. System modules are special .jai files we provide programmers. Users can import them to leverage OpenGL / D3D, font rendering, audio playback, and more. Which accounted for the 82 additional asserts. That's because the framework detects tests written in external modules, outside of our own test files. Now anyone on the team writing modules can write test procedures inside their module, tag them, and they're done. In fact, I have a file under tests/ that just imports all the modules. 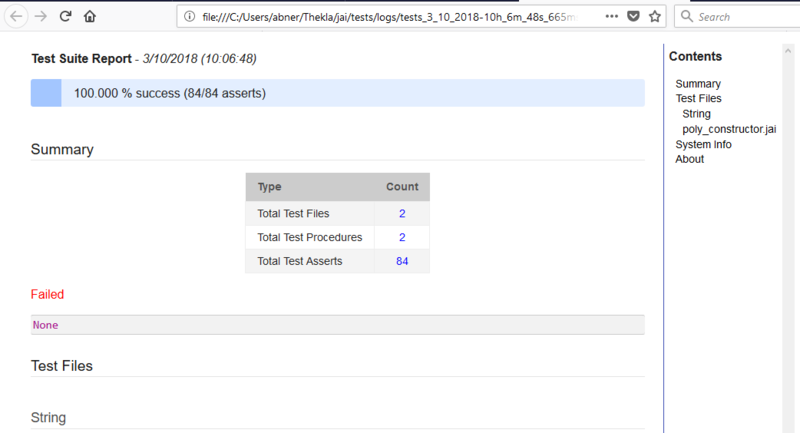 The actual tests can live right next to the module code, outside of our folder, and we register them for free just as we automatically register the test files inside the folder for free. And fret not, a module being imported multiple times will still have its test recognized only once. I'd like to note there are special settings and configurations the user doesn't know about (good! that's the point! ), and those who care can open up the build file, which is just the tests.jai source file. Documentation amounts to a few well-placed comments. Upon release (if we have time to make it happen), I'd like people to write their numerous test procedures, compile tests.jai, and have them witness Jon's bananas.jai but in the context of tests: A visualization of a growing tree of test files as branches, where each test procedure is a leaf from the branch. A common theme back at Kennedy Space Center was that we wanted to automate most of the "bookkeeping" so the engineer's time and effort went into thinking about the real problem. Interacting with build systems was not in our best interest! Even so, sometimes we were stuck with what I think were high-friction tools. I can't properly express to the reader how great it's been to write a tool that reduces friction nontrivially. Let's take a quick look at how the language played a part in letting me create this framework, as I think it has the right kind of features all statically-typed languages should have going forward. Initially, the main struggles in making the testing system work were psychological, working to unlearn years of how I was told automated test frameworks should be structured. My first attempt was writing a hybrid C++/Jai program with wacky command-line parameters. I think Jon nearly had a heart attack. It was difficult to implement something that met the criteria listed at the beginning of this post, because my model was tied to old-school software testing models. CxxTest is easy to use because it does not require precompiling a CxxTest testing library, it employs no advanced features of C++ (e.g. RTTI) and it supports a very flexible form of test discovery. Additionally, CxxTest supports test discovery. Tests are defined in C++ header files, which are parsed by CxxTest to automatically generate a test runner. Thus, CxxTest is somewhat easier to use than alternative C++ testing frameworks, since you do not need to register tests. Aha por dos! Test discovery is the property I want frameworks to exhibit. With CxxTest, though, we still need to understand its build system steps to reap the benefits, but that's a difficult limitation to overcome with C++. In jai, however, we can specify our build system in the language. So I made a source file, tests.jai. In said file, we can ask the compiler to compile any number of different files, and request it to open up its compilation stages to us as things get lexically scanned, parsed, and code generated. That's more than we care to ask for, so our entire build system can amount to compiling a single file, in the same way we compile any normal code. Where decl is the current code declaration we're inspecting from the AST. In the past, I used to check for procedure names starting with test, but Allen and Nico made me question whether that was too constraining. Turns out it was. 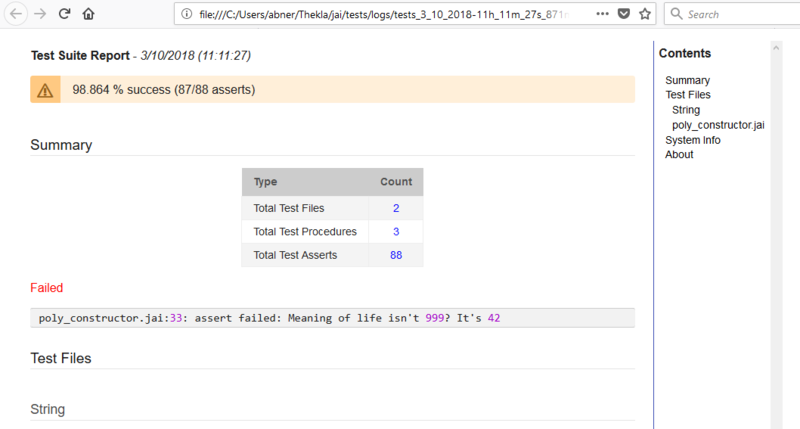 The downside with the notes here, though, is there might be tests importing external modules that tagged some of their code with @TestProcedure for unrelated reasons. I mitigate that by ignoring structs with that tag, and by verifying whether the procedure acts as an entry point (i.e. main with no parameters). There are other options available to us, but for now this is a good-enough solution. I register the discovered tests by creating register_test procedure calls on-the-fly--meaning I update the program's AST before things enter the bytecode pipeline. Where is the register_test procedure defined? Well, the dirty secret is I still wrote an actual test suite, contained in a single file living inside the tests/ folder. The build file has access to that, as do people. If anyone wishes to avoid all the automatic magic and also believe editing the build file is not enough, they are free to ignore it altogether and figure out how the suite works. They can register tests manually, generate reports however they see fit, and perform the entire job of a framework themselves. As we can see from the CxxTest homepage, it has different types of asserts for us to use. I had something similar going, but Ignacio reminded me that Jon added an assertion handler as part of the implicit context. That means we can override the behavior of regular asserts! This is what allows external modules to write officially-recognized tests inside their file and still compile anywhere--we're not requiring them to do anything special. I now enjoy writing tests whenever I need to, and I hope this straightforward style sounds appealing to some people. In other news, for the purpose of testing a compiler, will an automated test suite suffice? Not really, though it's a necessary first step. Although we've uncovered dozens upon dozens of important compiler bugs, we're starting to hit the ceiling of what human-made tests can offer. It's no surprise we've started to seriously look into a different beast entirely—a compiler fuzzer. But that's a story for another blog post! P.S. Shoutout to Josh, who among other things, helped write a bunch of the language tests and makes sure everything keeps running smoothly on Mac and Linux. That’s really nice! I’m myself a big fan of automatic discovery and I’m really pleased to see the straight forward way of pushing complications into a centered place. This is a great article. I share your thoughts on how testing should be, unobtrusive and as closely as real programs as it can be. Given that you are testing a compiler, how do you test for errors? Ensuring the compiler will error out on bad situations can be as important as doing the right thing. Have you found a way to apply this same scheme for errors? It’s like how some test frameworks work in python – nose, pytest. They use tests discovery, also some meta things which help you to do all stuff smoothly. If you need one global function that will create a particular entity, you can use fixtures with definitions of its lifetime(session, module, function). It’s helpful for some sort of tests. Very nice article that gives more insight into a special new language. Hope to be able to use the compiler soon.